Perfectly located between Pensacola and the Gulf of Mexico the Hampton Inn - Suites Pensacola/Gulf Breeze hotel offers the perfect environment for both the business and leisure traveler. The Hampton Inn - Suites Pensacola/Gulf Breeze is located just 5 miles from downtown Pensacola and only a mile from the sugar white beaches of the Gulf of Mexico and Pensacola Beach. The property is easily accessible from Pensacola Regional Airport Interstate 10 and Highway 98. Local attractions include the Blue Wahoos AA Baseball team and many festivals that take place throughout the year in downtown Pensacola. These include the Pensacola Jazz Festival the Pensacola Seafood Festival and the annual Fiesta of Five Flags. A wide variety of activities for the family are available within minutes of the property. These include deep sea fishing parasailing golf on many award winning local courses and visiting the National Naval Aviation Museum located at Naval Air Station Pensacola. 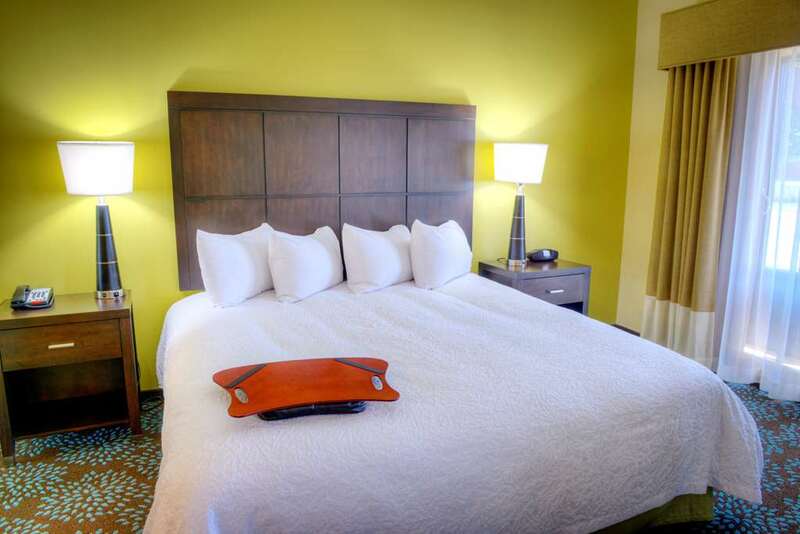 The hotel offers standard rooms featuring either one king size bed or two queen size beds. We also have rooms with one king bed and a sleeper sofa as well as King Studio suites. All rooms are comfortably furnished and feature microwaves and refrigerators and free high-speed wireless internet access. Be sure to enjoy our *On the House* hot breakfast each day featuring fresh waffles. The Hampton Inn - Suites in Gulf Breeze offers a business center located in our spacious lobby a 24 hour Suite shop and our Jump Start Fitness room. We also feature an outdoor pool and have a board room ready to host small meetings.